Street space is at a premium in this region. 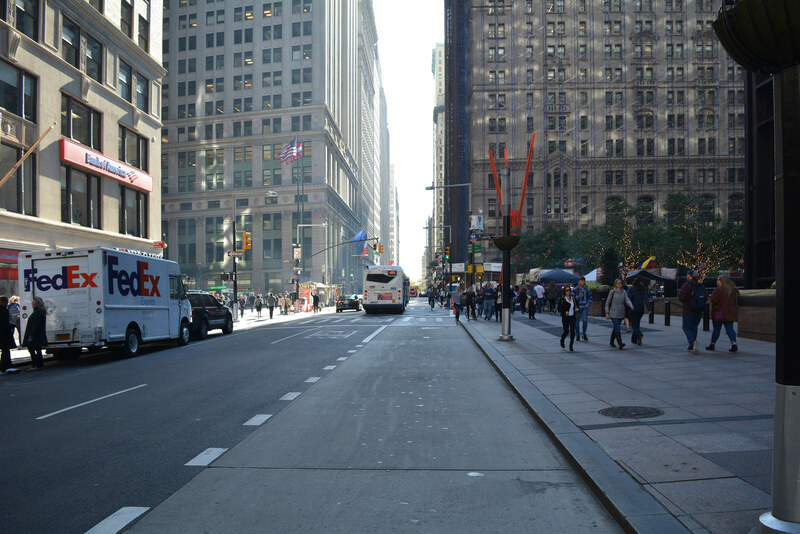 New York and other cities are particularly crowded, with pedestrians and cyclists competing for space with buses, cars, taxis, trucks, and emergency vehicles. Fortunately, there are a number of actions we can take to more actively manage and design our streets and roads to prioritize moving people and goods more efficiently and safely, while reducing air pollution, and absorbing rain water. In a dense region like ours, the demand for street and road space will always outpace the supply. The allocation of space leaves too little room for walking, biking, and transit, largely the result of decisions made throughout the 20th century. Progress has been made: New York City’s efforts to make streets safer has succeeded in cutting the number of annual traffic fatalities nearly in half, from 400 in 2000 to 229 in 2016. New York City has also built 1,200 miles of bicycle lanes, dozens on public plazas, and 15 Select Bus Service routes with more planned by 2030. One of the city’s jewels, Prospect Park, has recently been closed to cars. Jersey City introduced bike-share services in the last year, and White Plains has plans to improve bike and pedestrian infrastructure. But too many of our streets are still unsafe and given over to automobiles. Less than a quarter of all New York City’s street space is dedicated to sustainable modes of transportation—walking, cycling, and exclusive bike lanes—and most of this is concentrated in Manhattan and denser parts of the city. The vast majority of our streets and roads are handed over to private automobiles, taxis, and transportation-network companies’ delivery vehicles, freight trucks, construction equipment, garbage trucks, buses, and emergency vehicles. Many of these vehicles serve vital purposes, but they also cause air and noise pollution, clog up streets and roads, cause crashes, and generally increase the stress levels of drivers and pedestrians alike. By not managing roads effectively, valuable space isn’t used efficiently. Buses with dozens of passengers are stuck in the same traffic as vehicles with one passenger. Delivery and garbage trucks are free to make their runs at any time of day—even the busiest times. Clean, electric vehicles aren’t given any preference over vehicles that burn gasoline and cause air pollution. It costs more to take the bus or the subway into Manhattan than to drive over four of the East River Bridges. Car owners are provided free or heavily subsidized parking even though that land could be used for other purposes. And too little has been done—particularly outside New York City—to make streets safe. We must rationalize how we use our streets and roads. Not only is it vital for public health and quality of life, but also critical to the region’s economic vitality. Street design and management practice should be turned upside down to prioritize pedestrians, cyclists and transit users, followed by goods movement shared services and finally, the private automobile. The revolution in transportation that is occurring now, as on-demand, shared, and autonomous vehicles become more popular, is opening up a world of opportunities to manage and design our streets more strategically. Technology-enabled vehicles have the potential to make traveling much more efficient, reduce traffic, and dramatically cut back on the amount of parking a city needs. 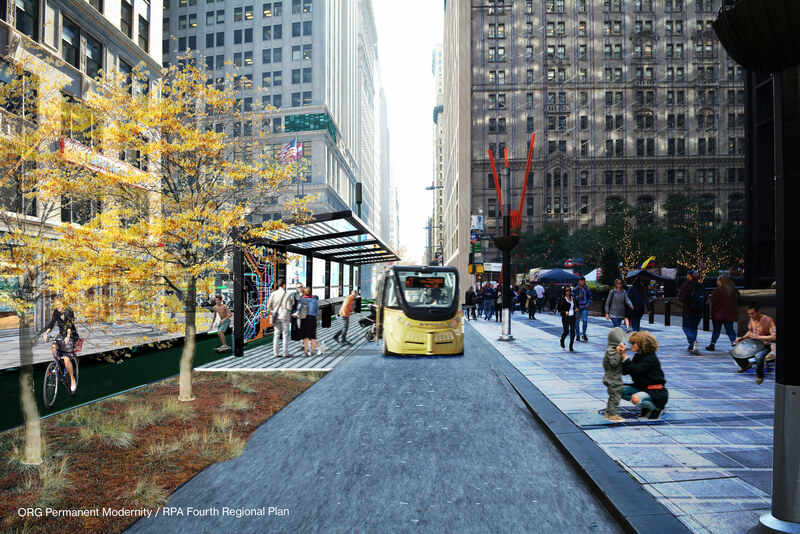 Municipal planning and transportation departments must harness the power of these new technologies to turn our city streets into healthy, active, and green spaces where people can reach their destinations efficiently and in a variety of ways. And planners and developers must prepare now for a future with new transportation technology and autonomous vehicles that reduce demand for parking. While streets and roads need to be improved across the region, certain places require more urgent attention. They are places that have the essential elements of what makes streets great for people—high concentrations of people and jobs, and high intersection densities—but that fail by other measures, such as number of crashes, air quality, tree-canopy coverage, and access to transit and bike infrastructure. In New York City, many of these neighborhoods are located in the Bronx and Manhattan, while outside the city, they are concentrated in western Nassau County, southern Westchester, Hudson County, and Essex County. Severe traffic congestion could be reduced by charging drivers a toll to enter Manhattan’s central business district (CBD), along 60th Street and from the East River Bridges. RPA has long supported congestion charging as a way to reduce traffic both in the CBD and in upper Manhattan, Brooklyn, and Queens. One of these proposals, Move NY, would combine new tolls with toll reductions on less-traveled routes farther from the core. Improvements in bus service and rationalizing fees for all for-hire vehicles would further reduce traffic in the CBD. In cities and downtowns, decades of auto-oriented design and management practices must be upended to prioritize walking, biking, and transit, followed by goods movement, on-demand services, and finally, travel by private automobiles. This new street hierarchy would be transformative. In New York City alone, 80 percent of street space could someday be allocated to walking, cycling, and public transit, up from approximately 25 percent today. While some of this change would require large-scale street reconstruction projects, low-cost treatments like paint, bollards, signage, and greenery could make a substantial difference in the near term. The densest parts of the city, where sidewalks are crowded and transit options are strong, should become either car-free pedestrian districts with no access for private automobiles, or low-car zones with very limited auto access, permitting only local residents, emergency vehicles, and local deliveries. One way to transition toward these car-free and low-car districts is to organize more regular street closures. Neighborhoods could be car-free during times of high traffic—on Halloween, for example—or throughout the summer, or on weekends. Just as technology is multiplying the number of ways people can get around—with on-demand, shared, and ultimately autonomous vehicles—technology can also multiply the number of ways cities can manage traffic. Digital signage could notify people when streets are temporarily closed to traffic. Technology already allows drivers to navigate the city through apps that report traffic crashes, speed traps, and street closures in real time. “Geofencing” technology could even more proactively redirect drivers to avoid particular streets during peak travel periods or districts prioritized for pedestrians and cyclists during weekends. There are many reasons to green the streets. More trees and landscaping make for a more pleasant streetscape, giving people places to sit and relax. They help clean the air, reduce heat, and absorb noise. They also absorb rainwater, and reduce storm-water runoff and flooding from heavy rains, especially in low-lying areas. New York and other communities should build on successful initiatives to improve the urban ecosystem—and boost public health—with bioswales, street trees, landscaping, and permeable pavement. Use textured pavement to delineate and designate areas for deliveries on shared streets. Waste and waste pick-up have a big impact on our streets. Trash bags are strewn along already narrow sidewalks, attracting rats and giving off foul smells in the summer heat. Hundreds of sanitation trucks are deployed every day—some for commercial waste and recycling, others for residential waste and recycling. They crowd city streets, slowing traffic and fouling the air. And recycling rates are still very low. A unified, single-stream recycling system should be adopted for both commercial and residential waste in New York City. In a single-stream system, all recyclable waste is collected by the same trucks, to be sorted into different streams—paper, metals, plastic, etc.—by special facilities. Single-stream systems have been adopted in thousands of municipalities across the U.S., and despite more upfront capital costs, they dramatically reduce the number of sanitation trucks on the road, boost recycling rates, and cut back on the amount of trash trucked to landfills. The New York City Department of Transportation oversees one of the most complicated urban transportation networks in the world. Managing 6,000 miles of streets and highways, nearly 13,000 signalized intersections, 800 bridges and tunnels, and many other infrastructure elements is a massive undertaking, and means the DOT cannot be involved at the hyper-local level. But communities could be empowered to make targeted decisions about their local streets. San Francisco, for example, recently launched GroundPlay, a multiagency effort to empower local leaders to make community-driven changes in their neighborhoods. GroundPlay identifies specific criteria for projects up-front, and then devolves some planning and design responsibility so citizens can work with their neighbors on public street art, plazas, and certain pedestrian safety projects. New York City should consolidate the myriad of application-based processes that different city agencies already run into one well-branded and unified entity. Empowering communities to take ownership of their streets would foster a culture of planning and vibrant street management. I want to bike around more, but the bike lanes are too narrow and there are too many cars parked in them. It feels dangerous. The shared public street space is likely to change more dramatically than any other part of the urban environment over the next few decades. With the proactive planning and management recommended here, these changes would result in streets that can move more people and goods in fewer vehicles, provide more options for getting around, improve health by making it easier and more enticing to walk or take a bike, and create public spaces that encourage positive social interactions. Scarce urban space currently used for parking and storing cars would be freed up for more productive activities. The region as a whole would be more competitive in attracting businesses, residents, and tourists. Many of the actions—redesigning the physical streetscape, implementing new technologies, putting in new bike and transit lanes and plazas—come at a substantial cost. An appropriate revenue source would be a share of congestion charges for entering the central business district or higher municipal parking curb-use fees that would also limit car use. Other actions would have a low monetary cost, such as regulations to limit car or truck use, but require a workable political consensus that is often difficult to achieve. Both short- and long-term success would depend on maintaining momentum from recent successes and replicating those successes in more locations and cities, effectively demonstrating benefits of more transformative change, and enlisting local organizations and business improvement districts to design district or neighborhood solutions.